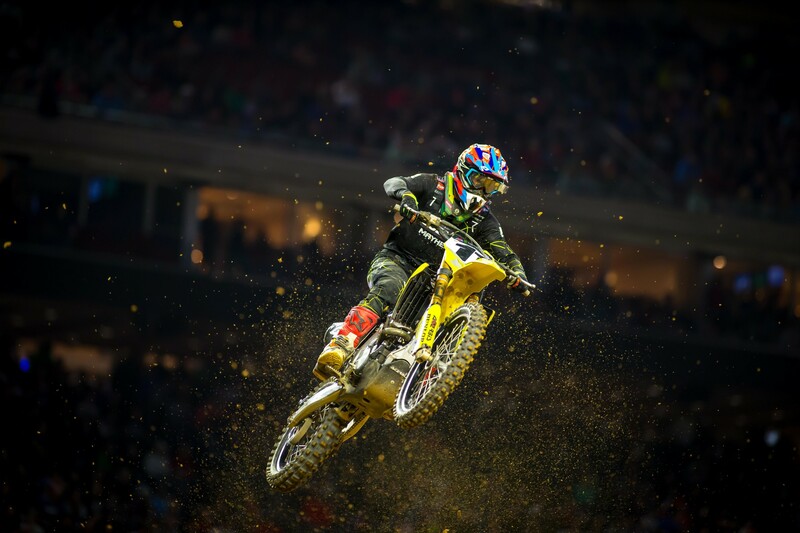 HEP Motorsports Suzuki’s Kyle Chisholm was involved in the first-lap crash with Chad Reed and Justin Brayton at Round 12 in Seattle but managed to get up and finished the race. His knee was sore after suffering what he believed was a bad bone bruise but decided to race the Triple Crown in Houston and rode his way to season-best 13th. After recording his best finish in a main event all year in the second main event, Alex Ray suffered a bike issue in the third main event that ended his night early. He finished 16th overall on the night. Our Aaron Hansel caught up to the HEP boys following the race in Houston. It was okay. I think I went 15-12-13 for 13th overall. On paper I feel like it’s not way better than where I’ve been finishing, but performance-wise, I feel I was better. It was one of those weeks where each moto you try to learn something and get a little bit better in each race. I’m always looking for ways how I can be better so I can work on it during the week. Kyle Chisholm: It’s okay. It’s sore, but it got a lot better during the week. It was nothing major, I just had a pretty good bone bruise from last week. It got quite a bit better throughout the week, it’s all good. So no big deal racing three times tonight then? Honestly, the Triple Crown is tough. It’s more riding and racing than we normally do, and there’s not that much time, not much of a break, between races. By the time we get back to the truck and get settled down it’s time to get back out there and into staging. It’s definitely tough and you have to be in shape to do it. We’re sprinting in those races too, it’s not like it’s a 20-minute race or a 30-minute moto where you can kind of settle into a pace and push through it. It’s intense and it’s sprinting in all three of them. I like it, but I wish the races were a little longer so we had a bit more of a break between each one. I like the 20 minutes because I feel like it’s a bit more of an advantage for me, but it was good. At an event like Houston, where you’re so far from the pits and it takes a while to get back and forth, is it harder to have a Triple Crown race? [Laughs] I feel like every time they have a Triple Crown almost it’s at venues that are like that. Last year in Atlanta it was a Triple Crown and the pits were in the other building. There was the new stadium, then the old stadium, then the pits in the other building. It was pretty far, and inside the building they wouldn’t let you ride the bikes so we had to push our bikes a long ways. When you got back to the track you had like ten minutes before you had to get back up. I think Vince Friese had a bike problem and ended up riding a different bike. They caught him and he got disqualified. They changed the rule this year though so you can take two bikes through tech inspection. It was an issue because there wasn’t enough time for the mechanics to fix what needed to be fixed. But it’s okay, we made it work tonight, and it’s a new format. They’re making improvements and they’re working out the kinks. I qualified well this morning, P15, and that was good for me. In the first main event I got together with Mike Alessi, it was just a racing incident, and it put us both on the ground. I charged back up to 17th, which is all I could do. I ended up popping a hole in my engine and my bike got really hot. We had to go back, fix that, make changes, and put in a new clutch. In the second main I felt really good, got 14th, which is the best finish all year for me in a main event. I was stoked on that but I was just sore. I’m having a back issue. It’s really tight and really sore. I’m doing therapy on it during the week to get it better. It’s unfortunate. In the third main event I was up to 15th and my bike shut off when I was going through the whoops. We need to get that figured out, but other than that, the team’s great and the bike is good. And other than my back, I’m all right. We’ll be ready for Nashville. It’s a home race for me. Rockstar Energy Husqvarna Factory Racing’s Thad Duvall made a last-lap pass on series point leader Kailub Russell to win the Steele Creek GNCC. Jacob Argubright went 1-2 with Dante Oliveira going 3-1 at the opening round of the AMA West Region ISDE Qualifier Series.